The entrance to Ouvrage Schoenenbourg along the Maginot Line in Alsace. 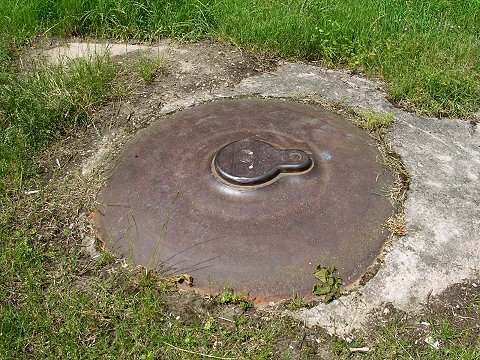 The Maginot Line, named after French minister of defense André Maginot, was a line of concrete fortifications, tank obstacles, artillery casemates and machine gun posts and other defenses which France constructed along its borders with Germany and with Italy, in the light of experience from World War I, and in the run-up to World War II. 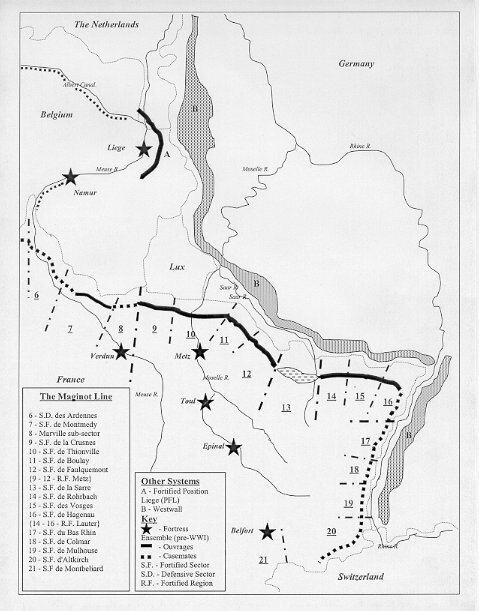 The French established the fortification to provide time for their army to mobilize in the event of attack and/or entice Germany to attack neutral Belgium to avoid a direct assault on the line. The success of static, defensive combat in World War I was a key influence on French thinking. The fortification system successfully dissuaded a direct attack. Instead, the German Army simply went around or over the Maginot line, which is why it remained relatively untouched. 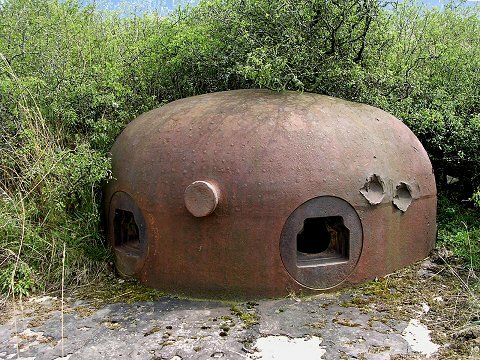 There are 142 ouvrages, 352 casemates, 78 shelters, 17 observatories and around 5,000 blockhouses over all of the Maginot Line. The view from a battery at Ouvrage Schoenenbourg in Alsace. Notice the retractable turret in the right foreground. 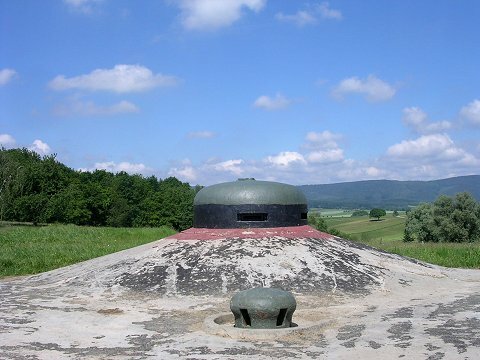 There are several kinds of armoured cloches. The word cloche is a French term meaning bell due to its shape. All cloches were made in an alloy steel. The cloches AM (Mixed weapons) are 72 on the line and are equipped with a pair of machine guns and a 25 mm anti-tank gun. Some cloches GFM were transformed into cloche AM in 1934. 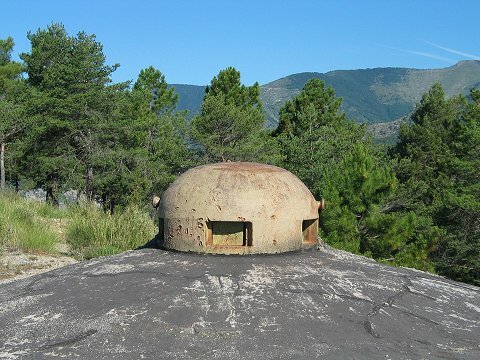 The most widespread are the cloches GFM, where GFM means Guettor - Rifle machine-gun. They are composed of 3 to 4 openings, called crenels. These crenels are next equipped by differents hoppers: Rifle machine-gun, direct vision block, binoculars block or mortar of 50 mm. Sometimes, the cloche is topped by a periscope. There are 1,118 cloches GFM on all the line. Almost every block, casemate and shelter is topped by one or two cloches GFM. The cloches VDP (direct and periscopic vision) are similar to the cloches VP, but have 2 or 3 openings to provide a direct view. Consequently, they were not covered by concrete. The cloches VP (periscopic vision) are 20 on all the line. Those cloches could be equipped with several different periscopes. Like the cloches LG, they were almost completely covered by concrete.